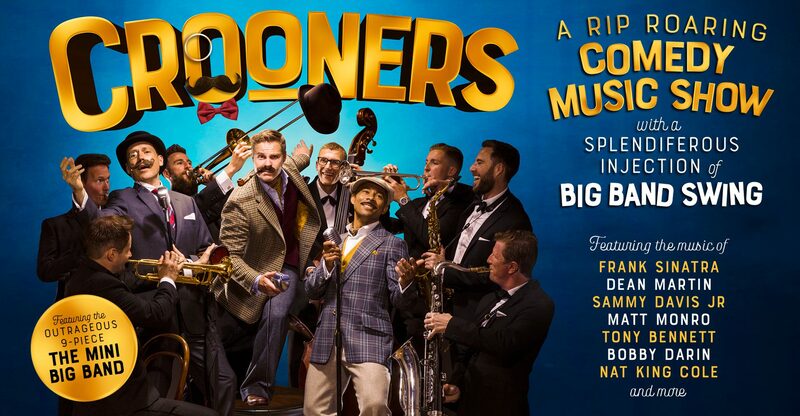 Crooners is a brand new, rip roaring comedy music show that has been wowing audiences with its witty and exhilarating show full of hilarious one liners, laugh out loud silliness and superb musical numbers with the outstanding 9-piece The Mini Big Band live on stage. The show plays homage to some of the greatest Crooners of all time with a splendiferous injection of Britishness. Featuring humour, tap dance and some of the most quintessential songs from Frank Sinatra, Dean Martin, Sammy Davis Jr, Matt Monro, Nat King Cole, Bobby Darin. Expect Some Lady is a Tramp, L.O.V.E, When You’re Smiling, Mack the Knife and many more…!